The research group led by Associate Professor Kenji Osafune and his colleague Shin-ichi Mae, both from CiRA, Kyoto University, has succeeded in developing a highly efficient method of inducing human induced pluripotent stem (iPS) cells to differentiate into intermediate mesoderm, the precursor of kidney, gonad, and other cell lineages. This represents a major step toward realizing renal regeneration. As nearly all kidney cells are derived through differentiation from intermediate mesoderm, to realize kidney regeneration requires first the development of an efficient technology for differentiating human iPS or embryonic stem (ES) cells into intermediate mesoderm. 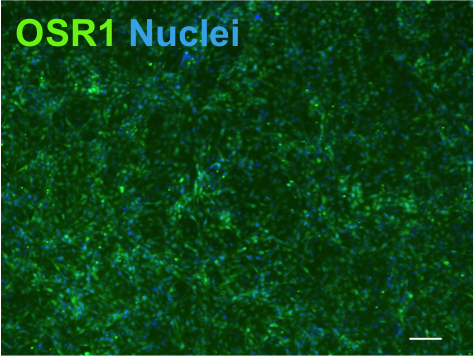 The research team established a method through which fluorescent protein can be readily inserted into the human iPS/ES cell genome through homologous recombination and used it in human iPS cells to successfully introduce green fluorescent protein (GFP) into Odd-skipped related 1: (OSR1), a marker gene for intermediate mesoderm differentiation. This makes it possible to ascertain whether differentiation into the target intermediate mesoderm cells has been achieved. The system was then used to establish a protocol for inducing iPS cell differentiation into intermediate mesoderm which produced a high success rate of 90% or more. It was confirmed that the resulting human intermediate mesoderm was able to differentiate into various types of kidney cell, and renal tubule structures were successfully generated. The findings indicate the possibility of using iPS cells to create a supply of cells for use in renal regenerative medicine. The differentiation system developed by the researchers is also expected to provide a new research tool to help elucidate the developmental mechanism of intermediate mesoderm. The next step required is to develop a technique that allows efficient and specific differentiation into kidney cells using intermediate mesoderm derived from human iPS/ES cells. As intermediate mesoderm is known to differentiate into the three different lineages of kidney, adrenal cortex, and gonad cells, the new technique has potential application in regenerative medicine not only for the kidney but also for the adrenal cortex and gonad. These findings were published online in Nature Communications on January 22 GMT. "Monitoring and robust induction of nephrogenic intermediate mesoderm from human pluripotent stem cells"